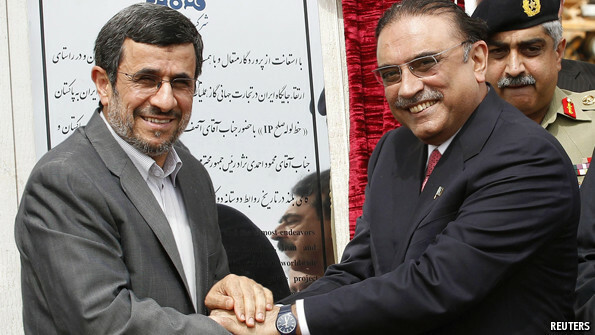 IT WAS smiles and handshakes all round on Pakistan’s border with Iran, as the presidents of the two countries posed on March 11th to mark the start of the construction of the Pakistani part of a pipeline that is supposed to bring Iranian natural gas to a country starved of energy. Blackouts cripple industry and bring daily misery to Pakistani households. The new pipeline is supposed to be completed by the end of 2014. Yet ending misery appears not to be among the chief political motives. Rather, Iran hopes that the project will lessen the country’s international isolation. Pakistan’s relations with its neighbour have usually been chilly. But under President Asif Ali Zardari, they have warmed. That is indicative of Pakistan’s tilt away from the United States, which lobbied the government in Islamabad against the deal and which has been pushing the idea of an alternative pipeline running from Turkmenistan, through war-ravaged Afghanistan, and then into Pakistan and India. Instead, Pakistan has also begun talks with Iran about an oil refinery at its Gulf port of Gwadar. Pakistan recently decided to hand control of the new deep-sea port there to the Chinese, another development that concerns the United States, not to mention India. The new pipeline comes from the giant South Pars gasfield and will snake into southern Pakistan. Iran has already built all but the final 320km (200 miles) of its bit of the pipeline, according to the deputy oil minister, Javad Owji. Now Pakistan has to build about 800km. That it has to pass through the insurgency-ridden province of Balochistan is only one cause for doubting its completion. It is also not clear how Pakistan, which is strapped for cash, will finance its part of the pipeline, especially if hit by international sanctions for dealing with Iran. What is more, this is the last week that the current government, led by Mr Zardari’s Pakistan Peoples Party, has in office. According to polls, the opposition party of Nawaz Sharif, who is close to Iran’s foe, Saudi Arabia, looks set to lead the next government after an election, likely in May. For five years, Mr Zardari’s administration has sat on the country’s energy crisis, with little action beyond get-rich-quick schemes for his cronies. The Iranian gas is not cheap. Exploiting Pakistan’s domestic reserves, which produce gas at about half the price, has been neglected. So, too, have imports of liquefied natural gas. Little has been done to deal with appalling inefficiencies in the country’s electricity system. But even though the announcement of the Iranian pipeline looks like a gimmick, the Americans’ idea of gas all the way from Turkmenistan is a pipe dream. Beleaguered Pakistanis have longer to wait before gas flows into homes, or blackouts are a thing of the past.